For medium duty weighing, the Brecknell PS1000/PS2000 series is hard to beat. Available in 1,000 or 2,000 pound capacities, these scales are perfect for weighing livestock, feed carts, bulk containers, institutional laundry carts and for general shipping and receiving. These scales feature an ABS LCD indicator evenoloped in a stainless steel casing and the base has integrated ramps. 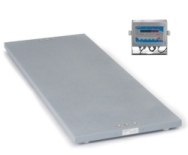 The indicator also includes an RS232 interface with standard NCI protocols and comes with a 10 foot DB9 cable. The PS1000/PS2000 also have an impressive selection of useful accessories such as a remote display, compact printer and handy floor indicator stand. The LW Measurments LVS is an affordable, full featured veterinary scale.The large pan is built from 304 grade stainless steel and features a comfortable rubber mat. Easy to operate and calibrate, it also features a serial port for communicating with a PC. 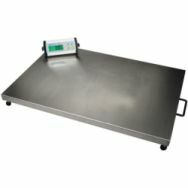 The VET400 is the perfect scale for veterinarians, kennels, labs or anyone handling medium to large size animals. The removable stainless steel platform makes cleanup fast and easy. Its scale base can be positioned up to 8 '/ 2.5m away from the display due to the coiled cable. The indicator features an adjustable mounting bracket for either desk or wall mount convenience. The scale and display are battery powered and have a power-saving automatic sleep mode. Automatic zero tracking maintains the scale at zero while the hold feature retains the displayed weight after the animal is removed.